Your food choices might be limited if you follow a strict diet or if you have a medical condition. At times, you can’t even enjoy your meals. If you are looking for healthy and delicious dishes, you can dine with your family and friends at a gluten-free restaurant in Middleton. Check the variety of dishes in a gluten-free restaurant in Middleton. A gluten-free restaurant in Middleton can offer various food options for customers. It can turn popular dishes into something you can enjoy. Feel free to choose from a wide variety of pizzas and pastas at a gluten-free restaurant in Middleton. Enjoy guilt-free dishes with the gluten-free menu at Benvenuto’s Italian Grill. Explain your dietary needs in a gluten-free restaurant in Middleton. When you make an order, take time to discuss with the server your condition. Tell him or her that you cannot eat some grain products, such as barley, wheat, and rye. The server should be able to tell you the meals you can eat, especially if you are a first-time diner in their gluten-free restaurant in Middleton. Don’t forget to double check your orders with the server. Consider the customer service of a gluten-free restaurant in Middleton. A gluten-free restaurant in Middleton has a special way of handling customers with different dietary concerns. The staff, who works for a gluten-free restaurant in Middleton, should give you his or her undivided attention as you discuss your specific needs. The server should be able to guide you with their gluten-free menu and can assure you that your food will be prepared properly. If you are looking for a gluten-free restaurant in Middleton, visit Benvenuto’s Italian Grill. Make reservations in a gluten-free restaurant in Middleton. If you have special dietary needs, it may be advisable to schedule a reservation either a day or hours before you dine in a gluten-free restaurant in Middleton. While you are on the phone with their staff, explain your case. This way, servers can better prepare your orders. Our gluten-free restaurant in Middleton is committed to serving clients with dietary restrictions and allergy concerns. We offer various gluten-free and low-gluten dishes in our menu, which has been approved by a licensed Wisconsin dietician and the Gluten Intolerance Group® (GIG). If you are looking for a gluten-free restaurant in Middleton, dine in at Benvenuto’s Italian Grill. Choose from our wide variety of pastas, pizzas, steaks, sandwiches, salads, and entrées served in our gluten-free restaurant in Middleton. Are you craving for steaks? We serve Sirloin and Ribeye with side choices in our gluten-free restaurant in Middleton. Our pastas are served either with a side salad or minestrone soup in our gluten-free restaurant in Middleton. We offer Portabella Penne, Shrimp Penne, Bruschetta Chicken Pasta, and Cajun Grill. You may also order Penne Marinara or Cheese Ravioli. We offer different 10" pizzas. Get a taste of Benvenuto, Margherita, Veggie, or Three Meat Combo. Feel free to also try BBQ Chicken and Formaggio. Are you looking for a gluten-free restaurant in Middleton? Visit Benvenuto’s Italian Grill today and check out our healthy and well-prepared dishes. Make a reservation online now. 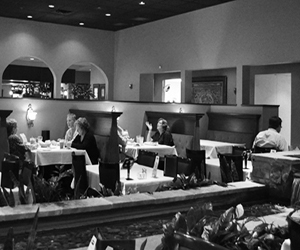 At Benvenuto’s Italian Grill, we offer a diverse selection of traditional Italian dishes. Some of our house specialties include our hand-stretched, wood-fired pizza, our daily fried fish, and our fresh salads and sides. To ensure that our guests never run out of new dishes to try, our featured menu rotates seasonally, changing four times per year. Try our famous meatballs topped with marinara sauce or our signature Italian salad! Click here to view our menus.